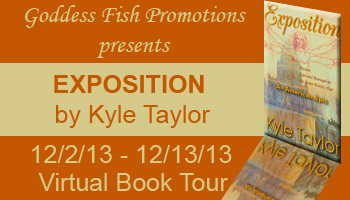 I’m happy to be part of the Goddess Fish Promotions Blog Tour for Exposition by Kyle Taylor. Drop by tomorrow and check it out. This entry was posted in Uncategorized and tagged Eden Glenn, Exposition, Gay Romance, Goddess Fish Promotions, Kyle Taylor. Bookmark the permalink. Hi Eden! I’m so excited to be with you tomorrow! My first book, Billion Dollar Dreamer will be free on Kindle to celebrate the last day of the tour.